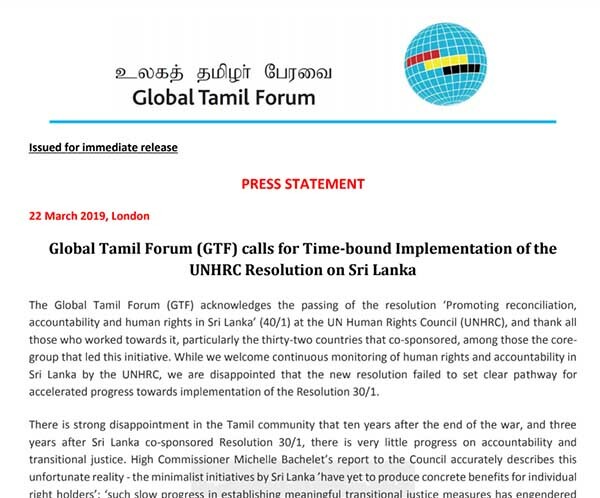 (Lanka e News - 22.March.2019, 11.30PM) The Global Tamil Forum (GTF) acknowledges the passing of the resolution ‘Promoting reconciliation, accountability and human rights in Sri Lanka’ (40/1) at the UN Human Rights Council (UNHRC), and thank all those who worked towards it, particularly the thirty-two countries that co-sponsored, among those the core-group that led this initiative. While we welcome continuous monitoring of human rights and accountability in Sri Lanka by the UNHRC, we are disappointed that the new resolution failed to set clear pathway for accelerated progress towards implementation of the Resolution 30/1. Resolution 40/1 seriously falls short of required action – Sri Lanka's abject failure and delay in implementing its key commitments, the continuing sufferings of the victims and their families, and the need for accelerated progress on constitutional reform for devolution of power have not merited mention; and it does not set timelines and benchmarks to guide and monitor progress. Our minimum expectation for this resolution was to incorporate a time-bound action plan with the involvement of the OHCHR – very much in alignment with High Commissioner’s recommendation. While the need for a time-bound implementation strategy is acknowledged, it is disappointing that the resolution lacks specificities of how it will become operational. It is our earnest request that such an operational arrangement be worked out as an urgent priority with the full involvement of the OHCHR. We urge member states to take note of the High Commissioner’s recommendation that they “investigate and prosecute, wherever possible, in particular in accordance with universal jurisdiction principles, those allegedly responsible for such violations as torture, enforced disappearance, war crimes or crimes against humanity; and explore other options to advance accountability in the absence of credible domestic processes.” We also urge member states to consider adopting parallel processes on accountability to supplement efforts by the UNHRC to deal with atrocity crimes in Sri Lanka during and after the war that ended ten years ago.